Christ is risen! Indeed, He is risen! Glory to Jesus Christ, glory forever! In the resplendent feast of Pascha there is a seeming contradiction. However, it is a contradiction only to the worldly-wise. Throughout the Great Fast, we are exhorted to make the effort to struggle ascetically, to put forth the effort to fast, to pray, and to give alms. The kontakion of the Great Canon of Saint Andrew of Crete exemplifies this exhortation, "My soul, my soul arise! Why art thou sleeping? The end is drawing near and you will be confounded. Awake then and be watchful, that you may be spared by Christ God, Who is everywhere and fills all things." 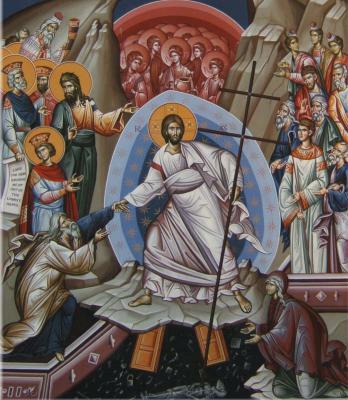 In the fifth Sunday of Great Lent, we are given the example and writing of Saint John Climacus and told to "Ascend, my brothers, ascend eagerly. Let your hearts' resolve to climb. Listen to the voice of the one who says: 'Come, let us go up to the mountain of the Lord, to the house of our God' (Isa. 2:3), Who makes our feet to be like the feet of the deer, 'Who sets us on the high places, that we may be triumphant on His road' (Hab. 3:19)." This exhortation is intensified the next week when we commemorate Saint Mary of Egypt who struggled ascetically for 47 years in the desert after living a life of debauchery. Yet, for those who have eyes to see and ears to hear (Matthew 13:9-16) this is no contradiction at all but truth. It is in truth, the divine economy. the possession most precious to God and most proper. become rich. He accepted the form of a servant that we might win back our freedom. Himself us, who were thrown down through the fall of sin. glorified with Him because we rose again with Him. The purpose of our ascetical struggle during Great Lent is not a moral one but an ontological one. Saint Paul provides us with the integral insight into this great mystery. save us is the only remedy to heal what ails us. Unworthily, I ask for your holy prayers during this paschal season.